The Trust develops partnerships for preservation, access, education and outreach programs that extend beyond the availability of state-funded activities. New York Archives magazine, published quarterly by the Archives Partnership Trust, is an educational publication about New York State history as revealed by research in archival records maintained throughout the state. The Trust helps to preserve and make accessible the archives from 350 years of New York’s colonial and state governments, so that they may be used for the benefit of the public. In celebration of the Erie Canal Bicentennial, the Archives Partnership Trust is proud to partner with Gallery5one in offering high quality reprints of select maps and photos from the New York State Archives collections. 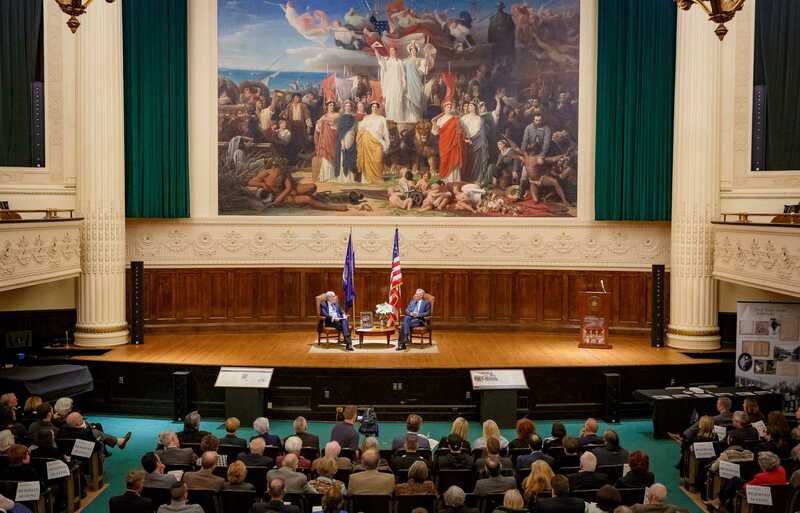 The Empire State Archives and History Award - Harold Holzer, nationally prominent Lincoln Scholar and 2017 laureate, interviews Stephen Lang, actor, writer, producer and 2018 Awardee, on stage at historic Chancellors Hall in Albany. The annual Student Research Awards program promotes and recognizes excellence in student research. April 24: Join us in Buffalo for "How to Trace your Family Tree at the New York State Archives"